Give clear plastics a new lease on life in one easy step! Meguiars Headlight & Clear Plastic Restoration Kit combines PlastX Clear Plastic Polish and a unique buffing pad to restore yellow, cloudy headlights fast! This 3-piece kit works with your electric drill to polish out clear plastics and headlight lenses to restore optical clarity. Cloudy headlights look unsightly and they’re a safety hazard. Oxidized headlight lenses prevent headlights and taillights from shining as brightly as they should, which is dangerous for you and other drivers. Meguiars Headlight & Clear Plastic Restoration Kit is a one-step process that eliminates plastic oxidation to clarify clear plastic head and taillight lens covers. The kit includes Meguiars PlastX, a proven clear plastic cleaner and polish. PlastX safely remove fine scratches, cloudiness, oxidaton, and yellowing from uncoated plastic surfaces. (Any protective film applied by the factory to your headlights is likely gone if they have oxidized. Therefore, you can safely use Meguiars Headlight & Clear Plastic Restoration Kit.) The kit also includes a sanding and finishing pad for those stubborn jobs. To use Meguiars Headlight & Clear Plastic Restoration Kit, apply a nickel-size amount of PlastX to the pad and place the pad onto the plastic surface. Turn on the drill and work the polish over the surface. Buff off the residue with the included microfiber towel. Stand back and admire your results! Tough cases may require a second application. In just one step, Meguiars Headlight & Clear Plastic Restoration Kit can restore aged clear plastics as good as new, or close to it! Save yourself $100s on costly replacements by using the Meguiars Headlight & Clear Plastic Restoration Kit on headlights, taillights, plastic convertible top windows, bug deflectors, boat windows, plastic aquariums, and motorcycle windscreens. Meguiars Headlight & Clear Plastic Restoration Kit improves the function and appearance of headlights and other hard clear plastics. Don’t waste another day with cloudy, yellow headlights. 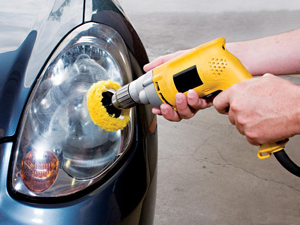 Clear them up with Meguiars Headlight & Clear Plastic Restoration Kit! Wash the used buffing pad and microfiber towel in McKee's 37 Polishing Pad Rejuvenator. The citrus detergent concentrate will remove polish residues so your tools are ready to go the next time you need them. No doubts about Meguiars products. Used them for year, just not this one...yet. Used this on my wife 06 bmw and the lenses look almost as good as new. spent about 2 hours total. doing it right takes time. Prosvary easy to use, clear instructions, great polish and sealer. I'VE USED MEGUIARS CLEAR PLASTIC POLISH ON MY 2001 FORD FOCUS' HEADLAMPS WITH VERY GOOD RESULTS. I HAVE NOT HAD TO USE MY DRILL, JUST A TERRYCLOTH PAD AND SOME ELBOW GREASE ROUGHLY ONCE A WEEK. "CLOUDY" PLASTIC HEADLAMPS ARE A SAFETY HAZARD. USE THIS PRODUCT TO PREVENT YOUR HEADLAMPS FROM HAVING "CLOUDY" CATARACTS !!!!! Bought thiskit because itwas a one step process- have tried the sanding types with no luck. This was easy, and amazing. Ihave a 1997 Mustang I bought for my daughter- it made the lights "like new". I read the reviews and watched the YouTube stuff on all these products. This one worked fantastically well. My lenses were really dull and pitted. So much so ithe headlight beam was trully dim. I highly recommend it. Be sure and tape the paintwork before using anything like this.